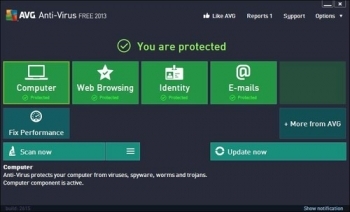 AVG free anti virus is one of the most complete programs we have found to date. AVG includes many new options to make it one of the most effective virus scanners on the market. It is still plagued by horrible slowdowns at times. Even things so simple as just typing an IM can be stopped for several seconds for some reason. If you can get passed the occasional slowdowns of your computer, the scanning functionality of AVG Antivirus is top of the line. With the rewrite of the scanning engine, AVG includes multi-processor support.